PMS 8000 C is the new generation of intensive care patient monitor especially designed for ICU/ CCU/ Operation room and trauma care. Equipped with 12.1’’ LED touch screen, SD card port, USB port, handle, multiple mounting solutions, IPX1 level waterproof cabinet design & sturdy housing to withstand rough handling. 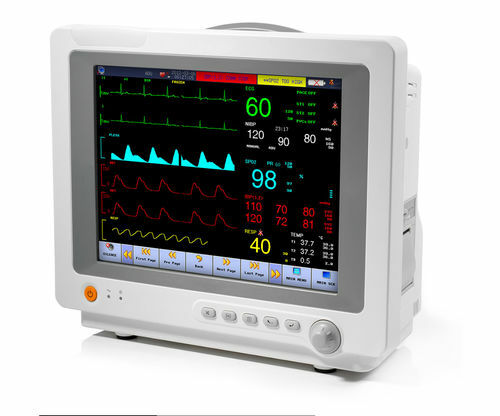 Fulfills the hardware requirements for intensive care monitoring in multiple environments. Over 16 kinds of arrhythmia analysis and alarm event review, hypoxemia report recording, Review and print 200 alarm events of arrhythmia and 2,000 groups of NIBP data;120hrs trend graph review. PMS 8000 C uses CardioTecTM ECG technology, world leading SPO2 technology, high precision AcuTecTM hypertension monitoring technology as standard configuration. Incorporates the world’s best medical technology for SpO2 , ICG, EtCO2 , Anesthesia Gas Monitoring like advanced SPO2 technology, Nellcor, Respironics, Phasein & Medis. Provides medical professionals with powerful monitoring options and functionality to match the demands of a wide range of care in any hospital environment.